“There’s a real breath of freedom in this music – because no one sings better of liberty than a person in chains” (“Il y a un vrai souffle de la liberte dans la musique Gnaoui, parce que personne ne chante mieux de la liberte qu’une personne enchaine” – Amazigh Kateb)…. 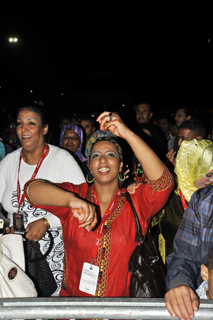 The roots of Gnaoua in the music brought to the Atlantic coast of Morocco by slaves from West Africa many years ago may not be immediately apparent in the joyous exuberance that overflows from the stages of the ‘Festival Gnaoua et Musiques du Monde’, but the ‘breath of freedom’ that Amazigh Kateb describes is there in all of the musical collaborations that are the essence of this unique event. 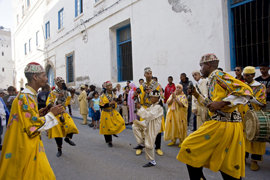 The 13th edition of the festival begins with an opening parade of all of the Gnaoua troupes in the festival; a noisy riotous affair, with each troupe entertaining the crowd between Bab Marrakech and the main square with their own style of Gnaoui music. They are followed by a ‘fantasia’- a tradition dating back to the 15th century; troupes of cavaliers on somewhat unruly Arab-Berber horses, nowadays used as an expression of joy linked to a major event – be it religious, national, regional or even familial. Fantasias also take place on the beach each day, including simulated horse races and somewhat alarming synchronised gun fire from the cavaliers. 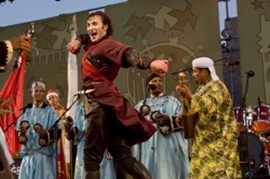 The opening concert of the festival is a spectacular dance fusion between the Georgian National ballet and the dancers of the Gnaoua troupes of Maâlems Mohamed Kouyou and Saïd Kouyou. An unlikely combination you may think, but as one of the three Festival Artistic Directors, Karim Ziad explains: “ We decided this year to give dance an important place in the festival because it is so important to the Gnaoui music…. When I had the chance to see the Georgian National Ballet the incredible energy they radiated seemed to me to be akin to the ‘African energy’. The enthusiastic crowds of Moroccans of all ages – from tiny babies to the very elderly – that pack the squares of Essaouira for the Festival are a testimony to the incredible popularity of Gnaoui music throughout Morocco. 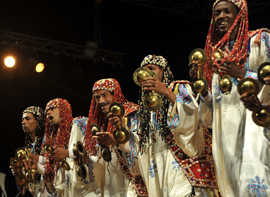 Gnaoua has however primarily a spiritual function – played during all-night ‘Lilas’ (literally ‘night’) in which different spirits are invoked and possessions take place. The trances which take hold of adepts during the Lila are said to have a therapeutic function; the Gnaoua Lila is thus both a ritual of healing and of possession. During the festival Lilas are staged in some of the indoor venues; on Thursday night I attended one of these in Zaouia Gnaoua, led by Maâlem Allal Soudaini; descendant of a line of Gnaoua, whose grandparents came to Essaouira as slaves from the Soudan. The Gnaoua troupe are a wide range of ages, the youngest being a small boy of around 10 years old, who executes the songs and dances with as much confidence, flair and enthusiasm as his older colleagues; his permanent grin evidence of his enjoyment of the ritual and pride in his place in the troupe. Whilst the Lilas during the Festival may not be as intense as those that take place behind closed doors, it is a chance for the festival audience to experience a little of the sacred and spiritual aspects of Gnaoua. Certainly the intimate nature of the venues, often architecturally impressive and charged with history, lends itself to an appreciation of Gnaoui music and culture on a deeper level than the exuberant flamboyant concerts on the main stages. Even without being a Gnaoua adept, in that far more intimate atmosphere, the hypnotic beat of the qraqebs (metal castanet-like instruments) and tambours (drums); the rhythmic bass of the Guembri, and the flowing melodic chants lend the music a power that reaches somewhere deep inside me, and I begin to see how it can induce trances…. 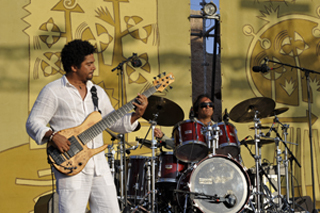 Maâlem Mahmoud Guinea – a son of Essaouira – is a veteran of musical collaboration with western artists, including amongst others Carlos Santana, and is one of the most respected and powerful Maâlems on the Gnaoua scene. One of the undoubted highlights of the festival is his concert with Mauretanien guitarist Daby Toure. Born in the Mauretanien desert, son of one of the members of emblematic African band Toure Kunda, Daby first immersed himself in the Wolof, Soninke and Toucouler musical cultures of West Africa, prior to establishing the group Toure Toure, mixing jazz and African musical influences. There is clearly a strong musical connection between the two musicians, and the infectious enjoyment that they share onstage spills over into the noisy joyful crowd. “I have a real feeling of humility with regard to the festival and the people I am working with here…. also joy and excitement… the Gnaouas represent a culture that touches me personally because of their links with my ancesters.” (Daby Toure). 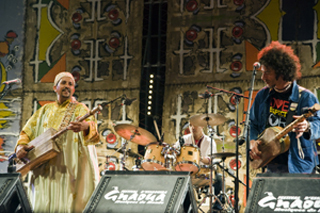 For many young North Africans, Algerian musician AmazighKateb represents a link between the traditional and the modern; his trail-blazing band Gnawa Diffusion, with their mix of Gnaoua, funk, reggae, rap and traditional African music played to packed audiences in France and the Maghreb for over 15 years up until 2007, when Amazigh embarked on a solo career. 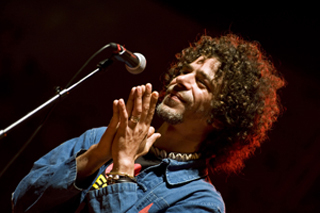 His first solo album, ‘Marchez Noir’, released in 2009, continues to develop Amazigh’s unique and subtle blending of traditional and modern musical influences, with his revolutionary spirit and uncompromising, politically charged lyrics. The album includes two songs whose lyrics are adapted from poems written by his late father, the highly respected writer Kateb Yacine, viewed by many as the father of modern Algerian literature. In a press conference given in the morning, Amazigh talks about his musical influences, and explains how, having been somewhat dismissive of traditional African music as a youngster – preferring Michael Jackson, funk and reggae – it was a trip into the desert and the discovery of Gnaoui music that led him to his appreciation of other African music. I ask him about the song ‘Africain’ on ‘Marchez Noir’, which he has described as ‘my own vision of ‘Africanness’ (‘Africanite): “ Young North Africans now have a much stronger sense of their identity as Africans… We are in the process of constructing a new Africa; a new ‘Africanite’, which also involves reconciling ourselves with our own history… slavery, colonialism, etc….”. He describes Essaouira and the festival as a place for genuine collaboration between artists from different parts of Africa and the rest of the world; a place where this new African identity can be explored and developed. Amazigh’s own collaboration at the festival is with Maâlem Abdeslam Alikane, one of the three Artistic Directors of the festival and an initiate of Gnaoui music since the age of 9. 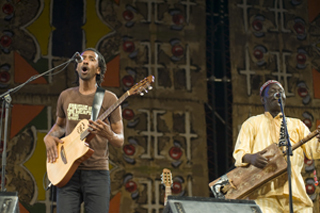 Abdeslam Alikane has toured extensively abroad with his group, Tyour Gnaoua, and has played with a number of foreign artists, including Peter Gabriel and Ray Lema. His presence on stage is relaxed and assured – clearly that of a master musician – and his voice is beautifully rich and mellow, providing a contrast to the hypnotic rhythms of the craqebs played by his troupe. 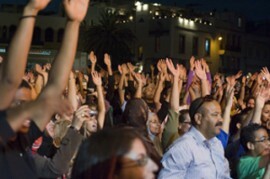 The exuberant lively crowd at the Bab Marrakech stage includes mothers with small children; groups of teenagers; elderly people and entire families – testimony to the huge popularity of the two musicians. Amazigh Kateb and Maâlem Abdeslam Alikane each perform a solo set, then come together onstage for a set they have prepared especially for the festival. For his solo venture Amazigh has retained the formidable talents of Amar Chaoui on percussion and Mohamed Abdennour on mandolin – two stalwarts of Gnawa Diffusion. Amazigh’s opening song begins as an almost solely vocal rendition of ‘Bonjour’ – one of his father’s poems – delivered with a passion and intensity that sends shivers up and down my spine… His evident love of and familiarity with Gnaoua music, and the respect for him and palpable enjoyment of his music that radiates from the Gnaoua troupe give this concert a completely unique and particularly uplifting atmosphere. 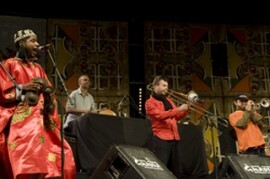 Later in the set Amazigh and Abdeslam Alikane are joined by French trombonist Daniel Zimmerman, who has thrown himself into the spirit of the festival and appears onstage with various other artists throughout the weekend. Earlier in the evening the crowd at the Bab Marrakech stage are treated to a ‘fusion’ concert par excellence; Maâlem Aziz Bakbou from Marrakech, together with trombonist Daniel Zimmerman; Afro-Cuban percussionist Oussama Chraibi, and members of the ‘Armenian Navy Band’ – pioneers of ‘new Armenian jazz’, they won the BBC award for ‘best world music group’ in 2006. Their music wanders between electronic; jazz; Asian percussion, pure groove and oriental trance. This unlikely combination of musicians, together with the acrobatic energy and pounding rhythms of Maâlem Aziz Bakbou’s Gnaoua troupe really sum up what this festival is all about; a joyful, dance-inducing, uplifting celebration of the power of music to find common ground among apparent difference, and to bring people together in mutual respect and pure enjoyment. 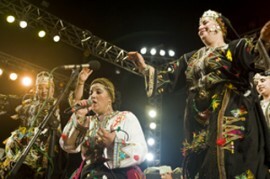 The only female singer at the festival is Raissa Fatima Tabaâmrant and her orchestra; a hugely popular Moroccan Berber singer who owed her initial success to the originality of her poetry, whose subject matter – which includes poverty; marginality; morals – struck a chord with her fellow Berbers. In 1991 she created her own orchestra which found immediate success. In full traditional Berber costume, Raissa Fatima and her female singers create a striking impression on stage, and the powerful connection she has with her audience is immediately apparent. I find myself wishing I could understand the lyrics, as the mainly Berber crowd near the front of the stage sing along with all of the songs, whose subject matter clearly resonates deeply with them. 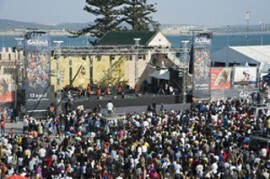 The festival organisers have this year saved the most popular artist till last; every available space in Place Moulay Hassan is packed on Sunday afternoon for the closing concert given by Maâlem Hamid El Kasri. One of the most popular Maâlems in Morocco, he began his apprenticeship at the age of 7, and specialises in fusions of Gnaoua styles from the north and south of Morocco. He has worked closely with Karim Ziad, Festival Artistic Director and renowned percussionist, and for this concert is joined on stage by Karim, plus a number of the other invited musicians who have performed during the festival, including Scott Kinsey, Nguyen Lê, Linley Marthe, David Aubaile and Vincent Mascart. 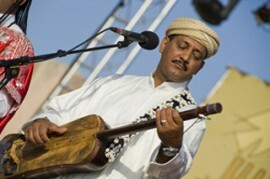 At one point violinist / Oud player Amir Ali (leader of group ‘MoRockin’) also appears onstage with his violin in an improvised burst of musical energy. Hamid El Kasri is the undisputed star of the show however, every song being greeted by rapturous enthusiasm by the crowd. His set combines old and new material, and manages to strike a subtle balance between evidently well rehearsed numbers, and the apparently spontaneous, joyful, seemingly improvised dance moves that the Gnaoua dancers in his troupe execute with such ease. The golden African late-afternoon sun shines down on the excited enthusiastic crowd, who dance, fling their hair around, shout, laugh, wave their arms and sing at the tops of their voices, as another unforgettably exuberant, uplifting and totally unique Gnaoua-Jazz-African experience draws to a close, and we all leave the festival a little bit richer in spirit….